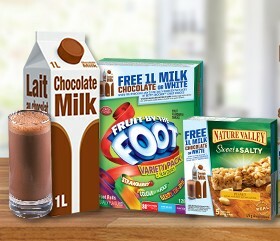 Get a FREE 1L CHOCOLATE OR WHITE MILK when you purchase any 1 specially marked package of Yoplait Source yogurt or 2 specially marked packages of Nature Valley Granola Bars or Betty Crocker child snacks. Pin Code must be used by July 31, 2016. Limited quantities available. OFFER ONLY VALID ON CHOCOLATE MILK IN QUEBEC. Offer void where prohibited. Offer not valid in NB, NL, NS, PE. Maximum value $3.00. See inside for PIN and instructions on how to redeem. Offer not valid on premium varieties of milk.